I think the first thing that comes to mind for a lot of people when they hear "pesto" or "creamy" is a pool of oil or cream in the bottom of a bowl with some pasta on top. Well, rest assured - this creamy pesto is neither of those things. The pasta that is just sitting in a pool of liquid is the reason why I worry when ordering pasta out because it leaves you feeling not so great after eating it, either because it was too oily or you feel like you just ate a cup of warm cream. 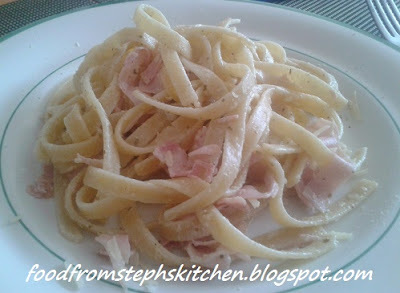 If you've tried my carbonara recipe you will know that I prefer a sticky creamy sauce - a sauce that coats the pasta rather than the pasta sitting in it. Firstly, put your pot of water on for your pasta. Once it has come to the boil, add a little salt and your pasta. While the pasta is cooking you'll have enough time to make the sauce. In a small sauce pan fry off your garlic and pesto, using the oil from the pesto itself. Only fry off for a couple of minutes, stirring frequently, until you can smell the aroma of the garlic. Turn to a low heat and stir through your lemon juice and zest, allowing to simmer for a minute. We had the lemon juice now so that it doesn't curdle the cream later. I like to add just that little bit of lemon because I really think it adds a fresh flavour to the sauce, and it brings out the basil a little bit more. Finally add your cream and stir the sauce until well combined and the cream starts to thicken slightly. Allow the sauce to simmer until the cream turns from white to a slightly yellow colour, then turn off the heat. You can leave it on longer but the sauce will just continue to thicken. Drain the water from your pasta and then add it back into the pot. Pour in your sauce and stir through your pasta so that it coats evenly. Serve immediately with grated parmesan cheese and cracked pepper.